“I want to make movies like the ones I used to like”. 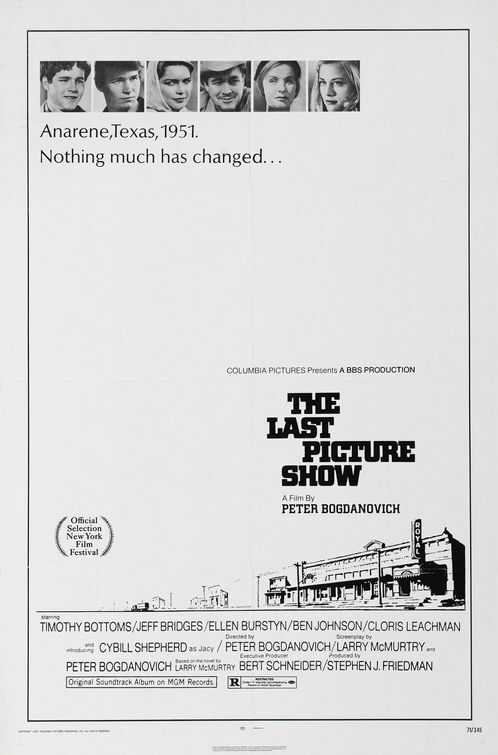 That’s what Peter Bogdanovich said shortly after completing his second feature, The Last Picture Show. He was 31 at the time, and had just achieved a feat to be respected. The Last Picture Show looks like a movie made in the 1930’s, due the choice of black&white as opposed to color. And due to the simple, even naive shot selection and montage. It’s like a classic created with the purpose of being a classic. The movie sat in my computer for several months, and I was somehow not attracted to watching it, until last night. And I saw it immediately after a very new and “quirky” American indie, World’s Greatest Dad, which aimed to be original (with some degree of success), but left me unmoved when I was supposed to give in to emotions. Just the opposite to the second movie of the double-bill night. Bogdanovich’s film has this star quality, this sense of timelessness and depth that is very difficult to find in modern films. The characters live in a very ordinary world, and are very ordinarily bored and lost and prematurely wasted. But they are larger than life, they seem to come from a distant time and bring something intangible, inspirational, hard to comprehend, but easy to feel. They are characters that are very probable to stay with you forever, in some capacity at least. Just pick an arbitrary scene – the last meeting between Sonny, the main hero, and Ruth Popper, the fortyish-year-old wife of his school coach, who is having a very gentle and romantic affair with Sonny… the way she acts – she did the scene without rehearsals, first-take… the death of the (apparently) slow boy, Billy, who was always sweeping the dusty streets that are constantly swept by the Texas winds anyway… the way Sonny used to flip his baseball hat around on Billy’s head, even during the funeral of their father-figure (for lack of real fathers), Sam the Lion… the scene at the “turtle tank” and Sam’s speech… the blonde starlet Jacy, mean or calculating or confused or just plain lonely, and her striptease at the pool… Duane punching holes in the wall with pool balls, or fretting on the lack of erection while trying to deflower Jacy – so just pick a scene and watch it separately, as a little short film on its own. It’s so worth it. The sad thing is, it seems more than certain a movie like this is impossible to make today. A very young director working in the 70’s created a movie based in the 50’s that looks like it was shot in the 30’s. Such an impossibility… or is it?